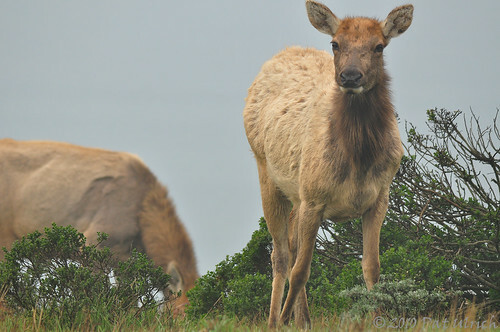 I encountered a herd of maybe 20-25 tule elk bulls with velvet antlers on a hike along the Tomales Point Trail in Point Reyes National Seashore earlier this week. The tall grasses are blooming on the grasslands, and I thought it would make for a great setting if I could find some elk. It's always fun to encounter a "bachelor herd" of males, since there's just something cool about seeing so many big bulls with their large antlers all at once. Unfortunately, they were in the foggiest part of the trail when I found them. Just 5 minutes up the trail I was above the rolling fog, and 5 minutes after the encounter I was below it -- but this is where the bulls were, so I made the best of it. At times, like for this shot, it briefly thinned out and the elk came into clear focus, but then moments later it could change back to pea soup. 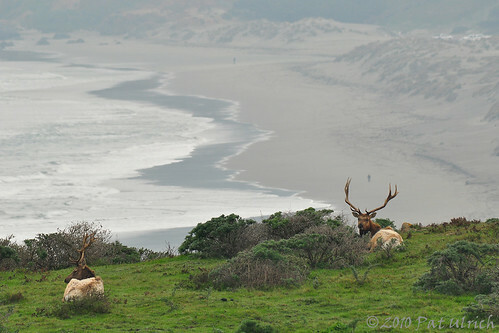 But really, is there anything more classic for Point Reyes than some elk shrouded in fog? 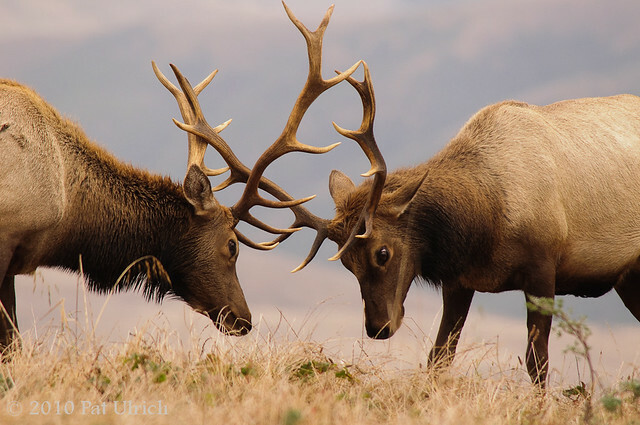 I have a lot of images to sort through from my time spent with the tule elk, including a kick-boxing match between two of them. I'm keeping my fingers crossed that at least a few of them will come out reasonably sharp through the fog. 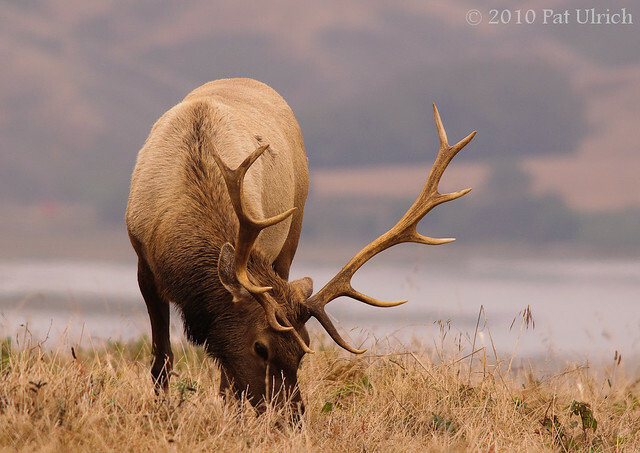 View more in my Tule Elk Gallery. 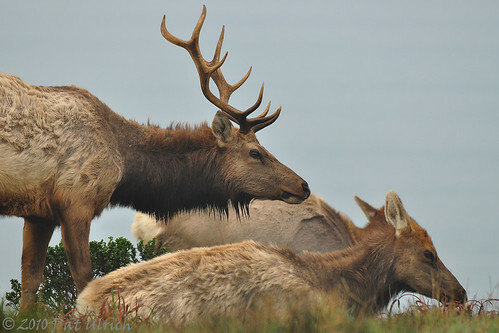 Two bull tule elk with velvet covered antlers stand in a field of wildflowers along the Tomales Point Trail in Point Reyes National Seashore. 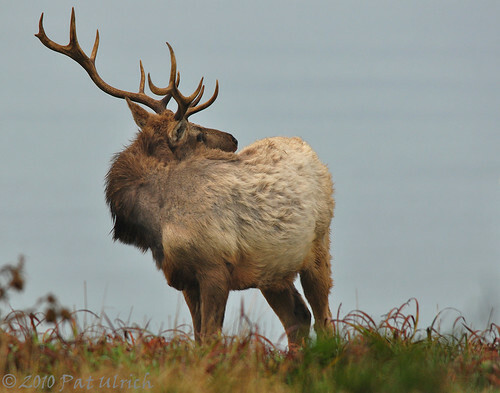 Browse my Tule Elk Gallery. Here is a series of images of our state bird, the California quail, taken at the Tomales Point Trailhead in Point Reyes National Seashore. As I mentioned in a previous post, the sun was just dropping below the horizon as I walked back to the parking lot and found this group of quail. Since the light was mostly gone, I upped the ISO to 1600, locked in the ballhead, and hoped for the best. I was quite pleased to have a few images come out pretty sharp under these conditions, especially with that nice warm evening light. It was great to hear him call as well, a sound I haven't heard since last summer. Unfortunately, the conditions just weren't great for a sharp shot of a bird in motion as it vocalized, so I was left with left with a bunch of disappointing images that lacked enough sharpness for my taste. Maybe next time! 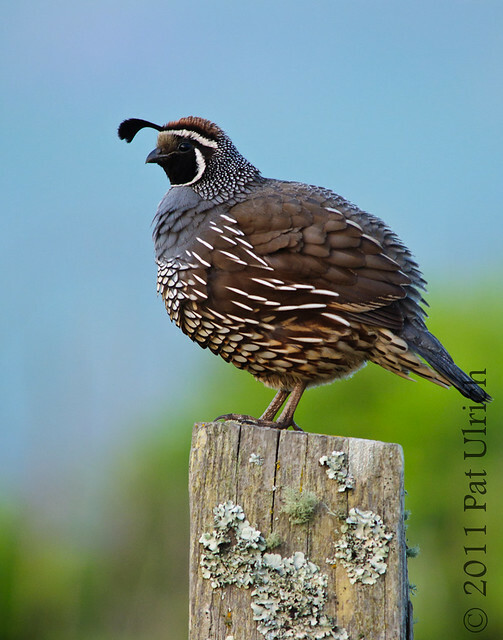 More images of these beautifully marked birds are available in my Quail Gallery. This post submitted to World Bird Wednesday -- follow the link to check out the great posts for this week! 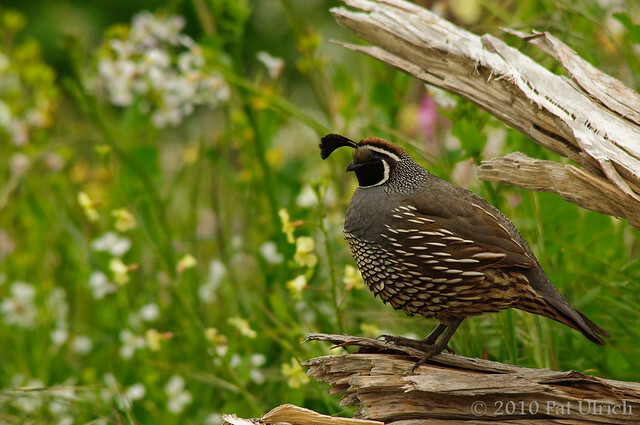 I just love to watch and photograph California quail. Other than shorebirds, they are quite possibly my favorite subjects. The arrival of spring means that they become a bit less secretive, as the males like to perch on tall objects and call out to let the ladies know they are there. 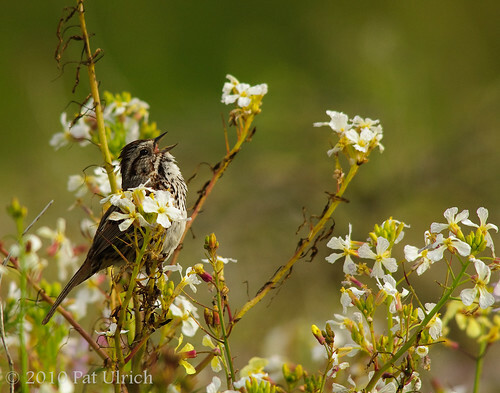 It's wonderful to be serenaded by their song as you walk through the coastal scrub. 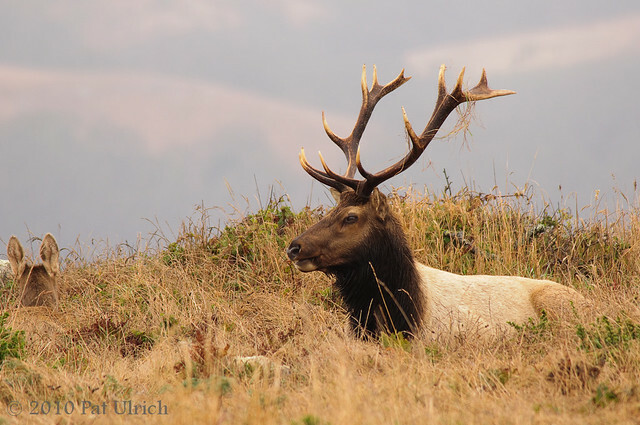 After taking a late afternoon hike out the Tomales Point Trail to find some elk with velvet antlers, I arrived back at the trailhead right as the sun was dropping below the horizon. Much to my delight, I was greeted by a group of around a dozen quail strolling along the far side of the parking lot. It was getting fairly dark already, so I upped the ISO to 1600 and hoped that the birds would stand fairly still. Thankfully, this male obliged as he stood on a lichen-covered fence post. 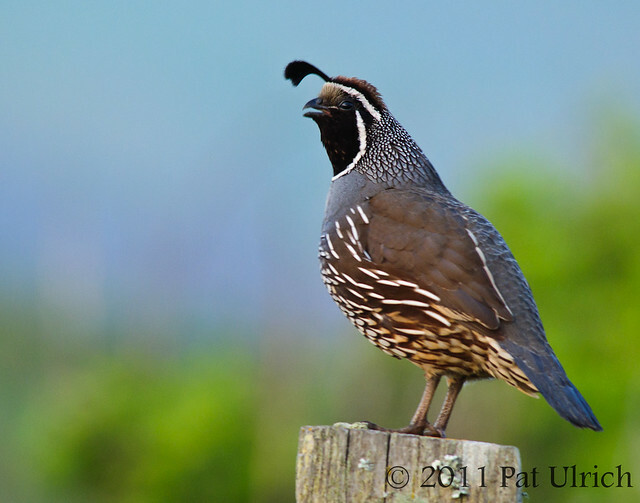 See more of the state bird of California in my Quail Gallery. 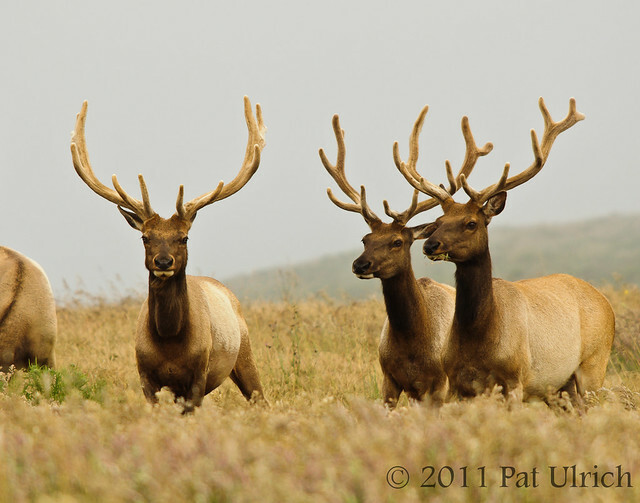 I love to see these regal animals with their velvet antlers during the spring. 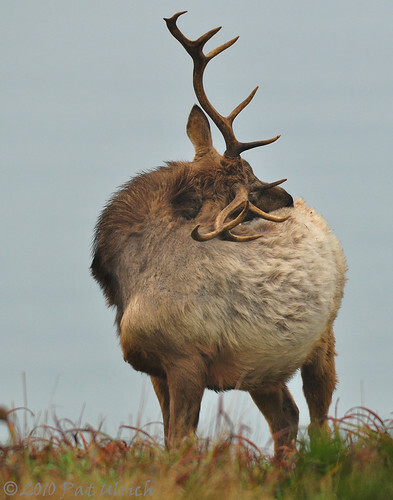 The amount of energy and resources they must invest in growing new antlers is really interesting, especially since only a few will be strong enough to win mating rights to a harem. These shots are from a hike I took out the Tomales Point Trail. A small herd of males were feeding on the grasses and wildflowers just off the trail. 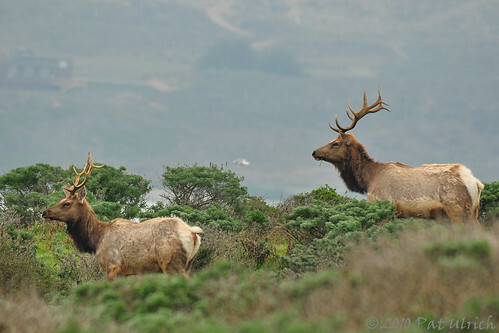 More of these handsome elk in my Tomales Point, Point Reyes National Seashore Gallery. Continuing the thread of my wishful thoughts of summer, here's another dive into an untouched folder from last May. This was one of one my favorite outings of the summer, and it occurred early in the season. 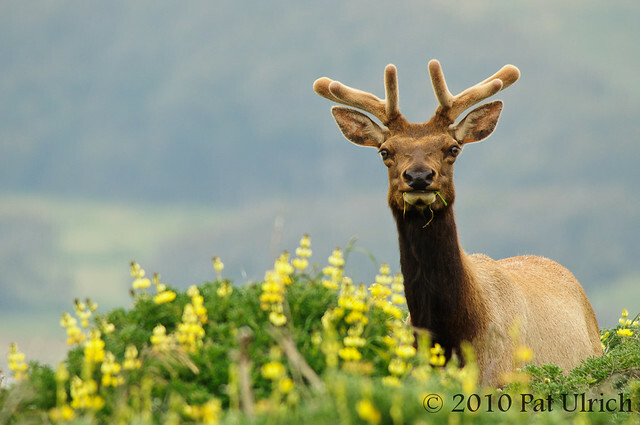 Point Reyes was awash in wildflowers and the elk and birds seemed to be enjoying it as much as I was. 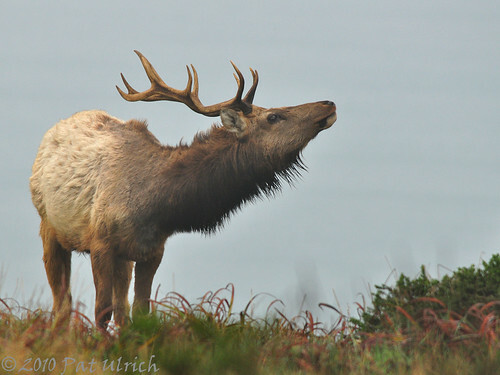 Browse more images of Point Reyes tule elk in my Tomales Point gallery. 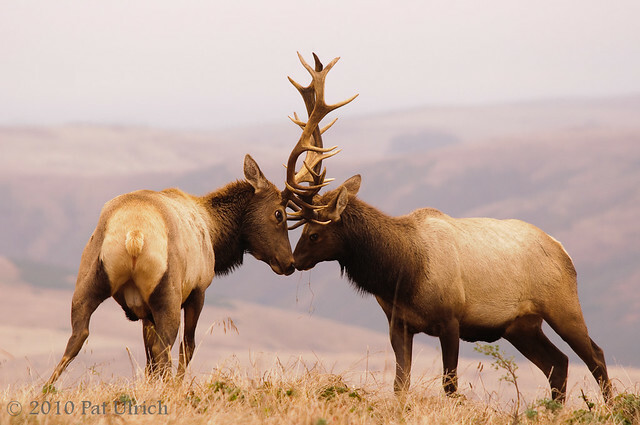 One of my other images from this fight has been selected as a nominee for the Viewer's Choice Award in the 2010 National Geographic Photo Contest. 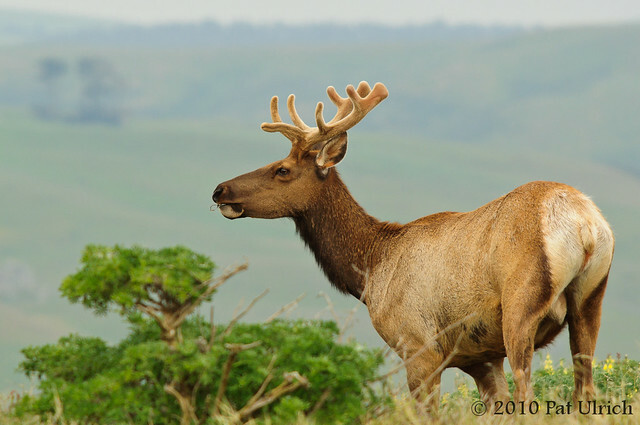 I could really use your help in the voting -- please follow the link below and rate my elk as a 10! Please follow this link to the National Geographic site and rate my image a 10! The voting ends on December 15. Thanks for voting and please spread the word to anyone that might be interested! 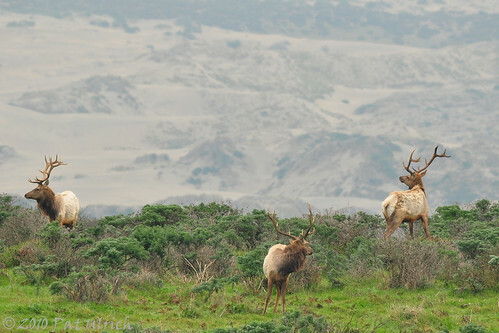 These are both shots of a fight between two male tule elk during the rutting season in Point Reyes National Seashore. 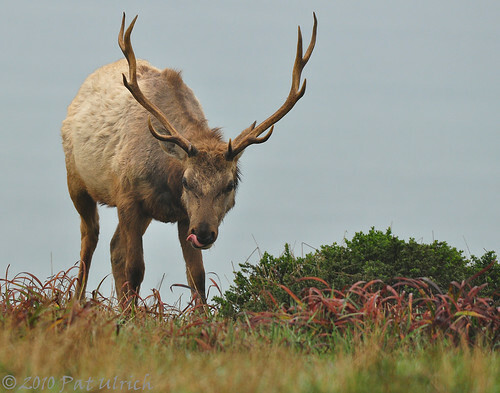 A bull tule elk grazing along Tomales Point in Point Reyes National Seashore in August of this year. This area was one of the best for seeing them along the trail, since I could get a nice background of both Tomales Bay and the hills on the other side. 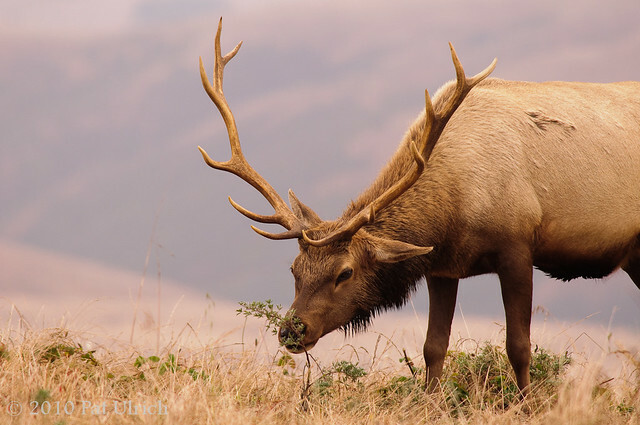 After coming over the hillside and chasing away two younger males who were mingling with the females (no fighting necessary, the smaller males just turned and ran to the outskirts of the group), this large male tule elk made himself a straw hat by digging around in the grass and then settled in to watch over his harem. He picked a spot that was right in a resting group of females, and he was alertly keeping an eye on the others. 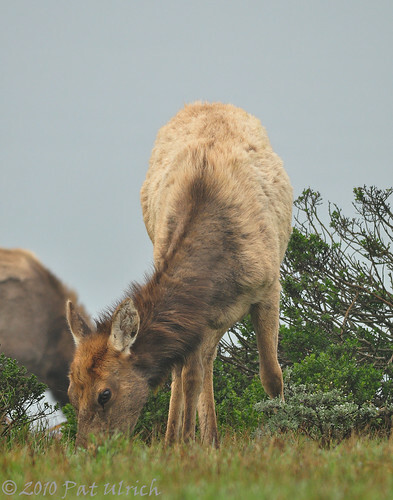 One of the exciting things about visiting the Tule elk during the rut, is that in addition to seeing bulls fighting, there is also a chance to see the young calves. I had seen juveniles on previous hikes at different times of year, but in August of this year we were treated to seeing a handful of calves still with their spots! 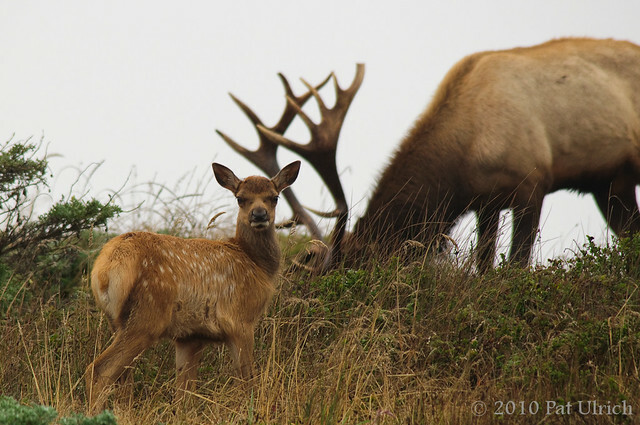 Before this trip, I didn't even know that elk were born with spots, and they sure are cute with them. While the composition was a bit tricky with that overcast sky above the hilltop, I really liked the contrast between the young calf and the large dominant bull in these shots. Who knows, perhaps this little one will one day have his own harem. I liked the shot below too, with the male seemingly keeping an eye out for, or perhaps on, the calf. 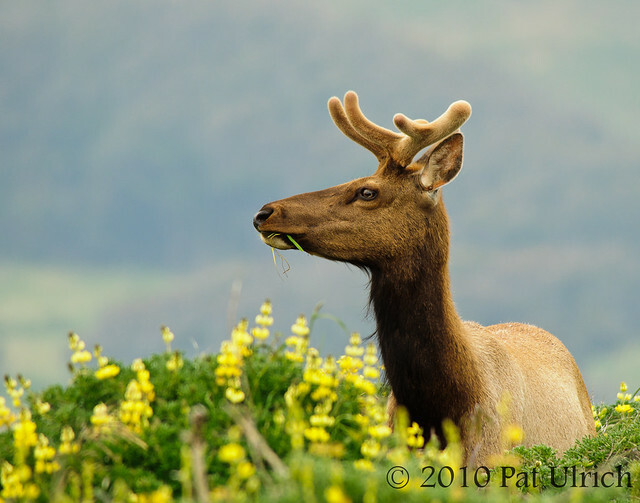 A bull tule elk in Point Reyes National Seashore checking out what looks to be a delicious branch of lupine. After a few weeks of traveling for a conference, a holiday in Europe, and visiting family, I'm back to the grind back at work and finally taking a few minutes to post a new image, with the goal of getting back to the regular pace of an image around every other day or so. In addition, I've increased the size of the blog page, since Flickr is now using a larger medium image size, and I like the increased detail of the 640 pixel image. 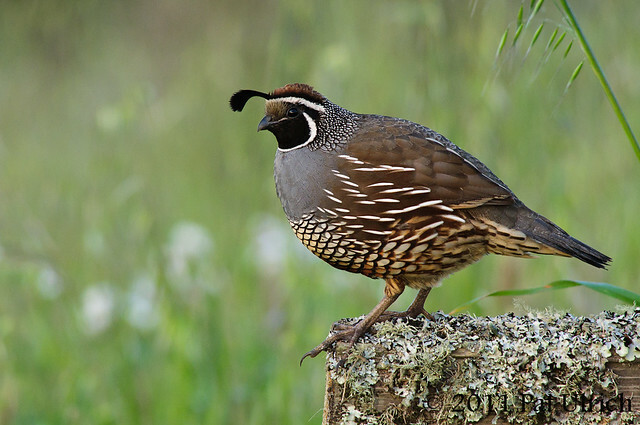 This is a male California quail being as conspicuous as possible while trying to attract a mate (and perhaps a friendly photographer?). 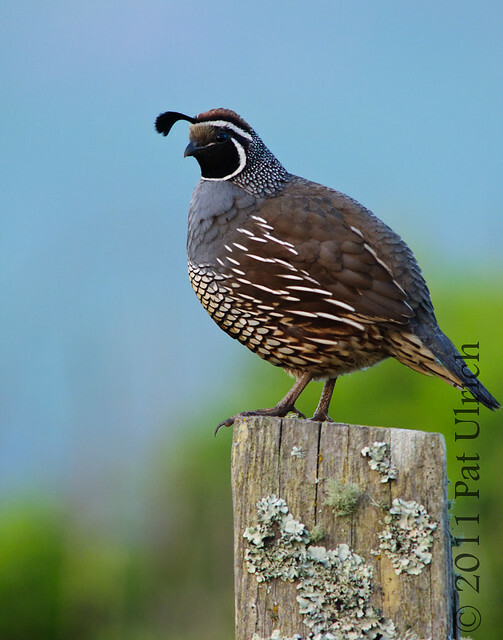 I took this shot on a weekend in May in which I was inundated in quail photography opportunities. This was actually among my goals for the trips I made to Point Reyes and Tennessee Valley, and I loved the many chances to photograph our striking state bird. This male is sitting on an old log near the Tomales Point Trailhead in Point Reyes National Seashore. 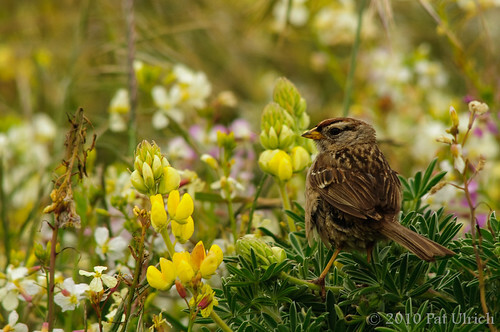 Another handful of sparrow shots from along the Tomales Point Trail in Point Reyes National Seashore. 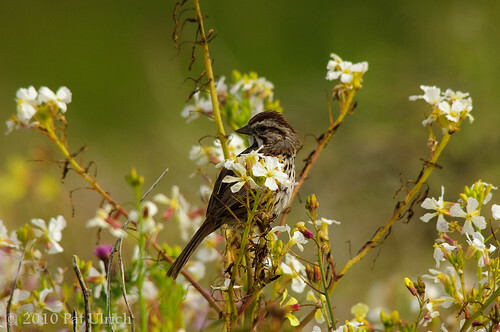 I believe these are white-crowned sparrows, one of the three sparrow species I was able to photograph on this hike (the Song sparrow in my previous post, and some Savannah sparrows that will appear in a future post). 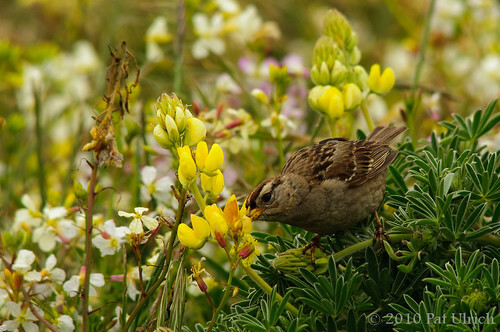 This one landed in the lupine and started pecking at the flowers. I suspect looking for some kind of seed? Although I'm not sure. 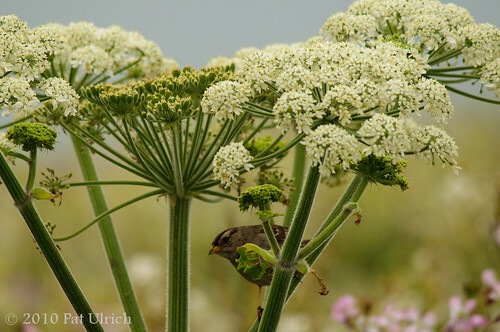 As I was walking down the trail, some of the birds would occasionally take cover below the tops of the vegetation, but this one was particularly curious while hiding on the underside of some cow parsnip. The Tomales Point Trail is just covered in wildflowers right now, especially over the first half mile or so. It was especially fun on my way out to take a few minutes every now and then to stop and wait until I heard a sparrow's song, and then try to locate it in the viewfinder. Most of them stayed a little more hidden in the vegetation, but every now and then one would display itself proudly. Watching this bull elk scratching those hard to reach places was fairly comical, and seemingly dangerous with those spikes. Taken alone the Tomales Point Trail in Point Reyes National Seashore in January. It seems like it might be fairly useful for helping to get rid of that thick winter coat too. There are many places along the California coast where I'm just in awe of the view that the cows seem to get! Driving down CA-1 from San Francisco to Morro Bay, I'm not sure how many awesome pastures we passed right on the coast. 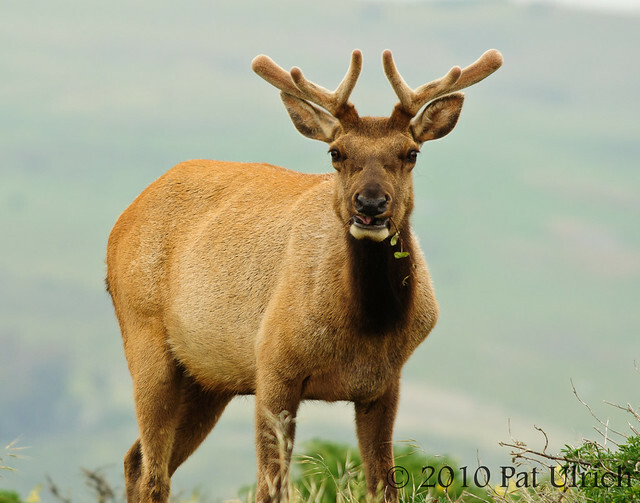 The same is true for the tule elk in the Reserve on Tomales Point in Point Reyes National Seashore -- although, I must say that this seems much more fitting! 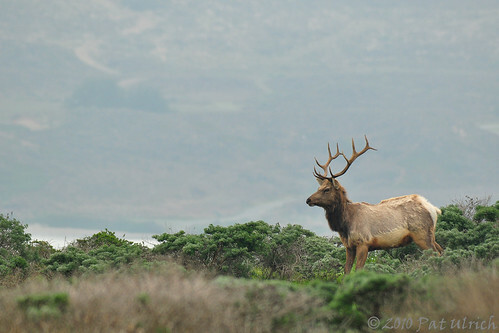 There are of course spectacular views of both the Pacific Ocean and Tomales Bay over the whole trip out to the end of the peninsula, and about 2/3 of the way there we encountered a herd of elk that were taking in some really nice views across Tomales Bay. Well, I'm not sure if they were taking in the views -- but it was nice to try to get some of the dunes and beach behind them. From the looks along the hike, that looks like a beach I would like to check out sometime -- nice large beach area and beautiful dunes. The area was becoming developed though, as you can see with a bit of a house in this shot -- it's not nearly as distracting as the pickup trucks and port-a-potties I got in the backdrop of some other shots though! 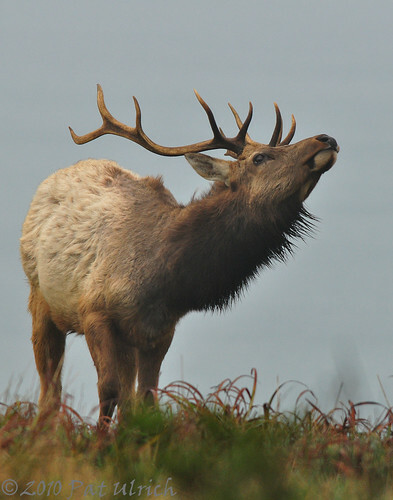 A bull tule elk taking in the smells in the air -- as you may have expected, his nose took him right to a female. From our hike out the Tomales Point Trail in Point Reyes National Seashore. This is the same bull as in a previous post, who was the dominant male in the first group of elk that we found along the trail. While he was certainly a fine specimen, he did not appear to be the biggest or have the largest set of antlers out of all of the bulls we saw that day, but he must have made up for it with his fighting skills. It was interesting to see the dynamics of the herds we saw, as there was always one large male within the main harem and typically a smaller group consisting of what must have been the losing males hanging out on the outskirts. They were usually within eyesight, but never venturing close enough to warrant attention from the big guy (at least at this time of year). While this shot is similar to the first (minus how I framed the image), what I really liked about it is how you can see how symmetric his rack really is. Definitely not something I would want to tangle with. After sniffing the air for a while, he followed his nose right to this relaxing cow, who was not all that happy to see him and quickly got up after this shot was taken, and strolled down the hillside. 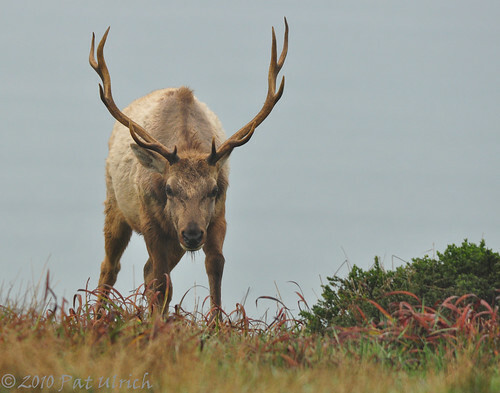 This lovely female was a member of the first group of tule elk that we found along Tomales Point Trail in Point Reyes National Seashore. She was fairly close to the trail which allowed for some great viewing, as well as the chance for some shots of her going about her morning routine. She was quite interested in her breakfast, and really didn't pay much attention to us as she browsed. Occasionally we would shift further up the trail to get a new angle on the scene, and she would raise her head to watch us in motion, but as soon as we stopped she went back to feeding. Since we started this hike early, there was still some fog in the air when we encountered this group on one of the higher ridgelines on the trail, and the speed at which the density changed was really something. One moment you could just make out their shapes in the grass, and then right before your eyes the details would emerge. These two shots came from one of the nicest breaks in the fog we got while watching this group, and in my haste to get off the shots with the new lighting, I nearly clipped off her ears. Fortunately, they just fit, even if I would have preferred a bit more space. Hiking the full lenght of the Tomales Point Trail (listed as 4.7 miles one-way) in Point Reyes National Seashore is something that had been on our list since moving to the Bay Area. This is a beautiful trail that stretches through coastal scrub and grasslands all the way to the the tip of Tomales Point with Tomales Bay on the east side of the peninsula, and the Pacific Ocean on the west. 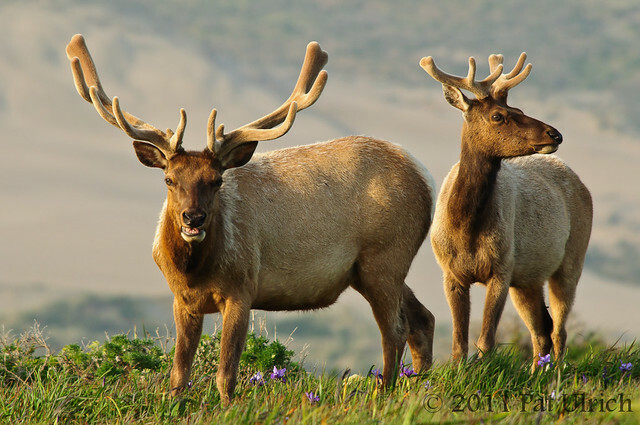 Perhaps the biggest attraction though, is that the trail runs through the Tule Elk Reserve, which hosts a reintroduced herd of tule elk, which now numbers ~440 elk. 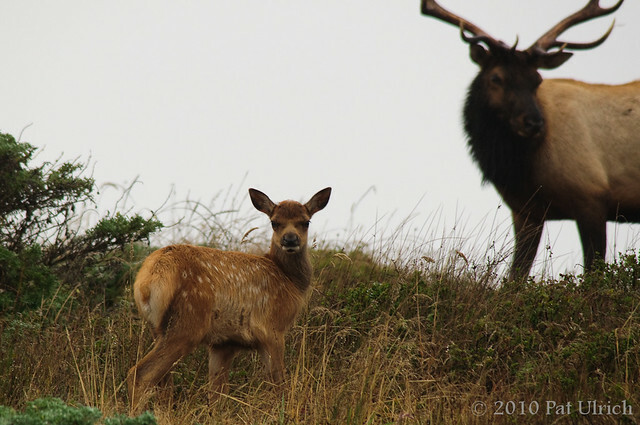 We attempted it once when we had family in town, but it was raining and fairly miserable, so after we saw a few tule elk far off the trail we decided to turn around only a few miles into it. However, two weekends ago the conditions looked great with a forecast of overcast skies and no rain, so we decided to attempt it again. As per my usual, we arrived right around sunrise and were the first car in the parking lot, meaning we were the first feet (of the human sort) on the trail. We had to go probably around 2 miles before we saw our first elk, and unfortunately it was at the top of a ridge that just happened to have fog rolling across it. However, we kept going a bit further and made it right into the heart of a herd of ~20 animals. While the females were quite beautiful, it was really the male who kept drawing our eyes -- and the shot of him above is from when he first came over the hillside and into view. He doesn't look quite as tough though, with his tongue sticking out!